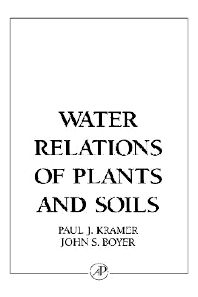 Water Relations of Plants and Soils, successor to the seminal 1983 book by Paul Kramer, covers the entire field of water relations using current concepts and consistent terminology. Emphasis is on the interdependence of processes, including rate of water absorption, rate of transpiration, resistance to water flow into roots, soil factors affecting water availability. New trends in the field, such as the consideration of roots (rather than leaves) as the primary sensors of water stress, are examined in detail. Preface. Historical Review. Functions and Properties of Water. Cell Water Relations. Soil and Water. Roots and Root Systems. The Absorption of Water and Root and Stem Pressures. Transpiration and the Ascent of Sap. Stomata and Gas Exchange. Ion Transport and Nitrogen Metabolism. Photosynthesis and Respiration. Growth. Evolution and Agricultural Water Use. Chapter Summaries. Chapter References. Subject Index. University of Delaware, Lewes, U.S.A.